Just a quick heads-up on our plans for this weekend. Saturday I am getting up v. early (and hopefully Scarlet will too, though this will have to be seen to be believed!) to pick up some perspex from Wakefield and Harrogate. Then off to Homebase or B&Q to buy some heavy duty bolts and large washers (to hold the perspex on without hopefully stressing it too much). If anyone has any idea how you should fasten perspex to a wood frame, then let me know - my thoughts were to drill carefully a hole in each corner then use a bolt or large screw with a big washer to prevent it from 'pinching' the perspex too much. OK Neil you sound like you are on track there, after some serious consultation with my other half Brian, he says make sure you measure, measure, measure, first BEFORE cutting to size, he tells me. heh heh heh. He has replaced this perspex stuff a couple of times here, Bunnings oh eerrrr yes.... your hardware shop will have the correct nuts/bolts/washers, just say what you need them for. He would pop over to give a hand but will be busy pouring a few acres of concrete that morning!!!! Good luck from us all here! Rubber washers against the perspex before the regular washers...helps prevent the perspex from cracking (its quite brittle). I love watching (and helping) DIY jobs. - but NOT those tv progs that I suspect don't show us the bits that went wrong! Relishing the prospects of seeing all this happen. Promise to keep sound off - though language is better than hitting something. Less painful too.. YES ! YES! I know i am late in speacking up but the rubber washer are a must to keep it from craking. THe coop will look so nice when you finish! I can hadrly wait ! Good Luck ! It starts tomorrow - i have to get up at 8:00am!!! You take it easy with your wrist, Red. I probably will miss all the fun, I'll be sleeping through it all. I'm hoping for a lie in, but I bet I end up having Caitlyn. Good job she's cute or I might refuse! BLIMEY !! I just flew all that way to see the coop, and now you are changing it ! Now I will have to come back to see it again, lol. Anyway, good luck (on getting Red up early) with it all, and remember.. lefty loosey, righty tighty... unless it is a nail which just goes inny. I wonder if Red and Neil are up yet, getting ready to head off to pick up the building suplies. You are about a mile from me!I just wish my "Zoom Out" facility would work though, especially on the Hybrid mode. 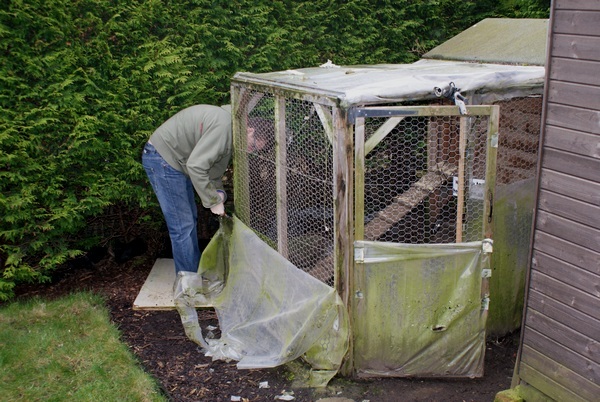 Red is still in bed, (you scally wag) Neil is on the move and the hens are wating for a new roof. Milly just had a lovely dust bath. update It's surfaced! So Scarlet is coming hurrah! Judging from the "stalker", seems Neil is parked at the hardware store. Thats not the way home Neil... but I understand, I got lost getting to your house too. ha ha ha That is hilarious, maybe they are going to buy morning tea. He said he was going to Harrogate for some of his supplies. Looks like they are on their way back home now. Still out and about.... how much stuff can you fit in that little car ?? lol. Hee hee, I can hear Neil and Red. And see their feet. Can't see any hens, though. Looks like it is all systems go now. Lots of sheets of stuff strewn around. We could use more than one view, there is so much to see but you w'nt see this message until later when it is all done and dusted. Gone quiet now. All finished? I think so... for now anyway! After our roadtrip, which involved picking up some flexible sheeting for the roof from Wakefield, some perspex from Harrogate for the front window, fittings from Bingley and a new faunarium for James from Shipley, we arrived back ready to do our worst! The original, with tatty sheeting that has taken a battering from the elements and is a bit manky! But under Tilly's guidance, the old sheeting starts to come off. 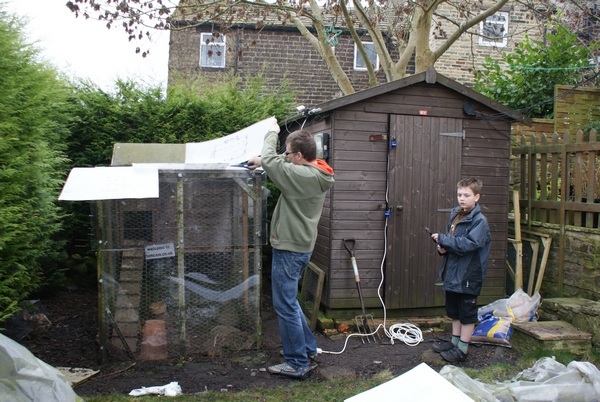 The chickens love the fact they have more light and hopefully the coop will last longer now there is a bit of ventilation (before water was collecting under the polythene sheeting making the wood damp). That is superb, Neil. It looks so very posh. And so much better without the crinkling/flapping of the old polythene noise. Glad you found the camera to record the "Before and After" sequence! Lovely job! One complaint; can't see the red ribbon - how is Helen going to Declare The Improvements Open?? Great job, Neil!! It looks very nice. I'm sorry I had to go to bed and I missed the whole remodel, but at least there are lots of pictures of the construction. I love the picture of Penny! OOhh missed it!! Its 5.30am just staggered out for a drink and to check progress, the coop looks very open and light and bright. Just right for the girls. I see the young lads of the neighbourhood poppped by to offer some advice and moral support. 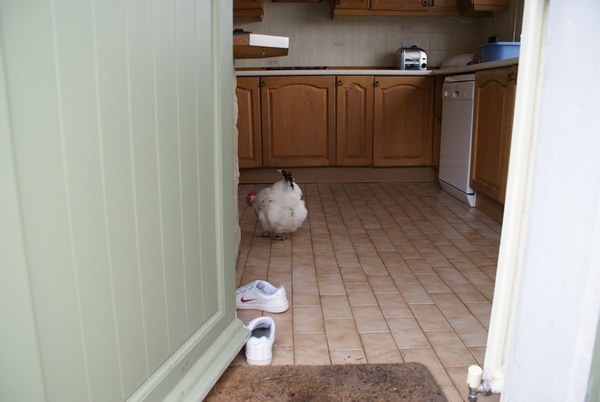 Cheeky Milly raiding the kitchen, she's lovely and fluffy and plump and happy. Tilly looks to be saying 'carefull with that hammer Neil, mind your fingers". 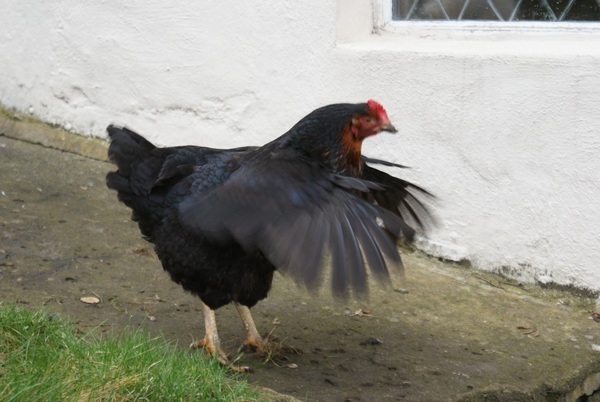 Penny's wing flap may be due to testing her flying feathers, if she didnt like the new coop roof she would be off to the neighbours". I was there all day. First following the shopping expedition, then the construction. Then when I put sound back on it was lovely. 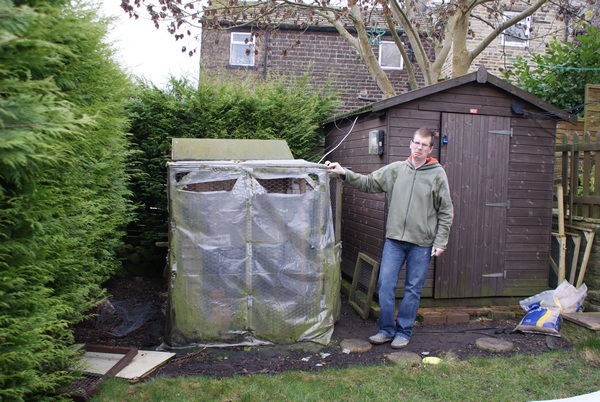 All the constant flappng polythene had been sent to the bin and replaced with beautiful solid clear sheets. Mel seems pleased, it will be much less draughty for her. Great job Neil! Looks quite spiffy and bright. I saw/heard bits of the construction work. I wonder if the hens like looking out of their lovely clean new windows and skylight? I like the photo of Milly in the kitchen. It'd be great to find a chicken in my kitchen looking for food. 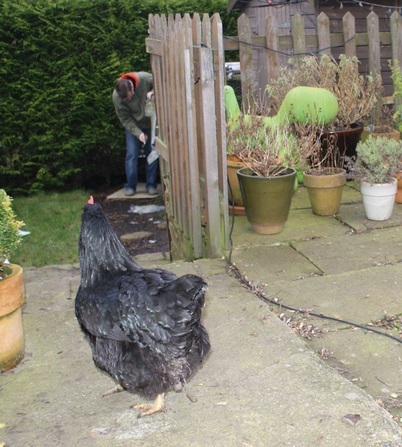 Actually, one did once fly over and wander in our door while we were trying to get her home. I'd forgotten about that. I didn't really do much, just watched over the girls' and took photos...my dad did all the hard work ;) He's done really well though! If it came to a fight, my money weould be on the girls, not Smudge! I saw Smudge pause outside the coop for a bit while I was watching sleeping hens on Saturday night, presumably having a good look inside through the new perspex. Lovely job! the girl will enjoy all the light and to be able to see out! Very nice indeed, good job ! Everything looks all bright and squeaky clean in the coop now! 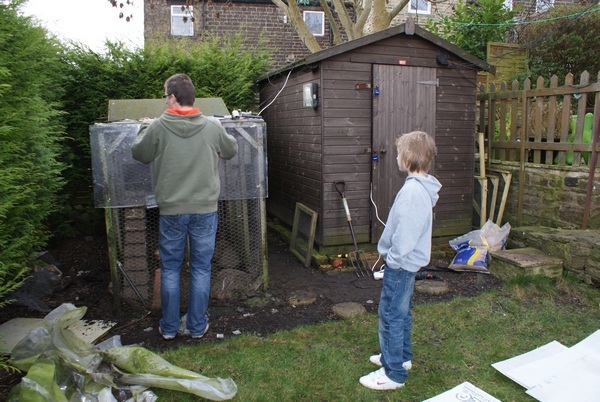 Now the work that so very desparatly need to be done over here is the last side panel on the hen house! It has been 3 weeks and he still has not finished it ! Grrr! 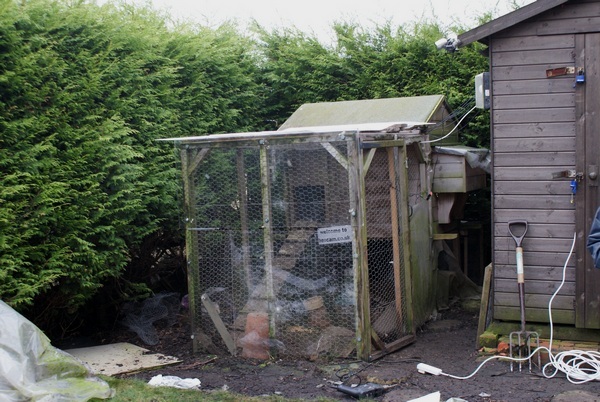 the wire on the hen house is not strong enough to keep out a very determined racoon. he has been worrying at it and he will get throw in a night or two . so guess what he is doing whenhe gets up to morrow ! I will be there with the hammmer and the nails ! no skiving off. ya! I wish he is soring in bed right now and it is 3 inthe after noon! poor darling he worked late . but he is going to get up in the next 15 min as i have too much to do to let it all go to waist! So ... is the coop done frogdust?! Or is Arthur done over? yes! Yes, he got right out of bed and got to it ! he was surprised at how late it was! I made him some lunch and some lemonade with Ice and took it out to him. he had worked over time so he was very tired ! racoon ! the dogs chased him off at twielite last night . he was out there in the mist chattereing to him self. But at least the roof is repaired, and it's a lot more secure so hopefully will withstand the weather for a bit. What did you finally use for the roof Neil? (I might have missed it somewhere else). Well, the same covering, but apart from heavy-duty staples (which were physically ripped from the wood in the gales), there are sections of wood screwed down to hold it in place securely - will post a photo (it ain't pretty!) when I get chance. Also, thanks to CC who sent a donation to go towards the cost to the new mic and wiring ( ) so thank you so much! I hope to get the bits and pieces and get it all wired up in the next couple of days - I'll pay particular attention to water-proofing too! Yet agine another Saturday..... It has been raining for the last 4 days . we got up this morning and wow ! it isnt raining ! so what to do, what to do? It looks like we are going to fix the pully on the suburban(car) the "beast" need matinace and to day is the day. That is unless I can come up with some thing a lot more fun ! it is too darn cold to work on the yard . so every body what are you up to to day? Ugh... cleaning, chasing hens round our garden, driving to a tile showroom to order tiles for the bathroom... What a horrible Saturday! OH hey ! I'd love chooseing tile for my bath room. now the cleaning part is not so fun LOL! Poor Neil you have it so bad ! I've been babysitting, vacuuming, washing, cleaning, cooking, more babysitting, had visitors, played with the rats, cleaned both cages out, and now finally I get to sit down and surf the net. What a long day! Tomorrow - as above, but hope to get to make some more hammocks for the rats! I had to do the ironing this morning so I did it at 8:30am to get it out of the way! Dad, did you do those photos for that corn snake guy? Shouldn't that be 'Yes dear,' Neil...?